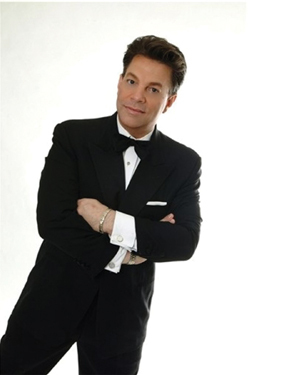 Direct from Las Vegas, Steve Lippia returns to the South Florida stage with Bob Lappin and The Palm Beach Pops to immortalize the music of Frank Sinatra. Considered by many to be the best interpreter of the Sinatra styling performing today, Lippia has become one of the most in-demand vocalists to introduce the Great American standards to new generations across the country. This engaging entertainer with the haunting voice and distinctive phrasing will perform classics like “Come Fly With Me,” I’ve Got the World on a String,” “Witchcraft,” “The Best is Yet to Come,” “All the Way” and many other favorites. This concert series, A Salute to the Music of Frank Sinatra, is the last for the Palm Beach Pops’ 2008-2009 season. Performance dates are April 5, 6 and 7 at the Carole and Barry Kaye Performing Arts Auditorium at Florida Atlantic University in Boca Raton at 8:00 p.m. and on April 10 and 11 at the Kravis Center for Performing Arts at Dreyfoos Hall, West Palm Beach at 8:00 p.m. Tickets range from $29 to $89 and can be purchased on line at www.palmbeachpops.org or at the Kravis Center Box Office by calling 561-832-7469 or at the FAU Box Office by calling 954-462-0222. The 2009-2010 concert season for Bob Lappin and The Palm Beach Pops will open in November 2009 with A Night In New York featuring the music inspired by The Big Apple, from Leonard Bernstein to Billy Joel and from Tin Pan Alley to Broadway. The Palm Beach Pops’ eighteenth concert season from November 2009 through April 2010 will pay tribute to the music of Johnny Mercer, Barbra Streisand, Sammy Davis Jr., Andrew Lloyd Webber and the Big Band Era. 2009-2010 season subscriptions are now available by calling the Palm Beach Pops Box Office at 561-832-7677 or at www.palmbeachpops.org. Steve Lippia has become one of the most prominent, in-demand vocalists and has quickly established his place among the finest performers of standards and traditional pop music in the nation. Steve’s youthful and energetic talent creates a perfect blend of “classic” with “today,” introducing a new generation to this timeless music, while appealing to long-time listeners. Steve has headlined in highly successful, extended engagements at the Rio Suites Hotel and Casino in Las Vegas and Resorts Hotel and Casino in Atlantic City, where audiences lined up more than two hours before show time to vie for seating. As well, Steve has performed to sold-out audiences with major symphonies across North America and has headlined to sold-out crowds at the legendary Birdland Jazz Club in New York City, backed by the Nelson Riddle and Woody Herman Orchestras. Some of the network television shows in which Steve has performed and been interviewed include “Extra”, Fox’s “Good Day New York”, CNN’s “Showbiz Today”, ABC and the BBC. Steve’s much acclaimed self-titled CD was recorded at Warner Brothers’ studios in Los Angeles with a 41-piece symphony. In addition, Steve has recorded “Steve Lippia Live”, a collection of some of his live performances.